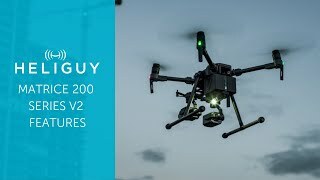 Heliguy InsiderFeature ArticlesIs RTK the future of drone mapping? 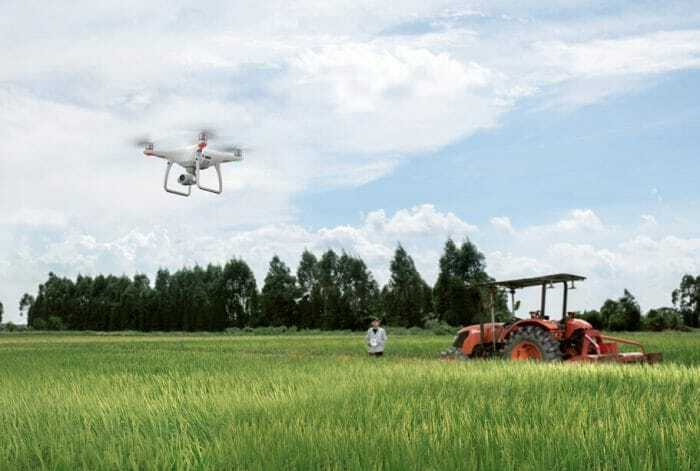 Is RTK the future of drone mapping? 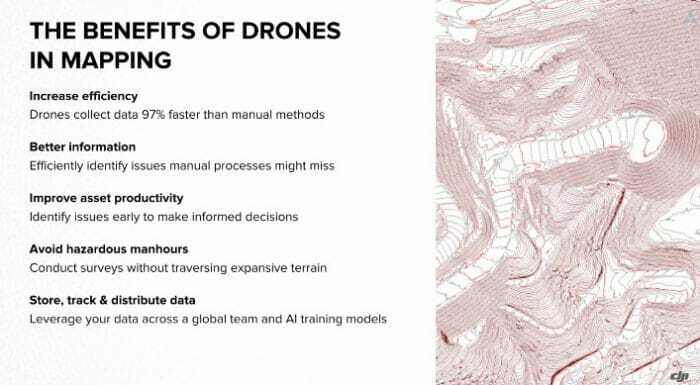 This is the prediction by industry expert William Pryor, enterprise solutions manager for Skycatch, who set out his vision during a recent webinar about capturing precision data with drones. In his opinion, RTK – or real-time kinematic to give its name in full – is very much the future when it comes to UAV mapping. He believes that, thanks to RTK’s advantages – such as higher accuracy, reduced costs and improved safety – more and more people will turn to this technology. 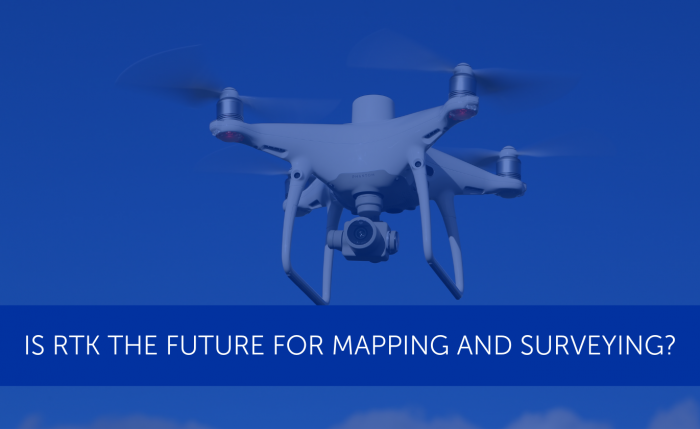 In this blog, Heliguy Insider takes a look at drone mapping and explores the various techniques, from ground-control points (GCP) to the rise in PPK (Post Processed Kinematic) and RTK and what they mean for you. 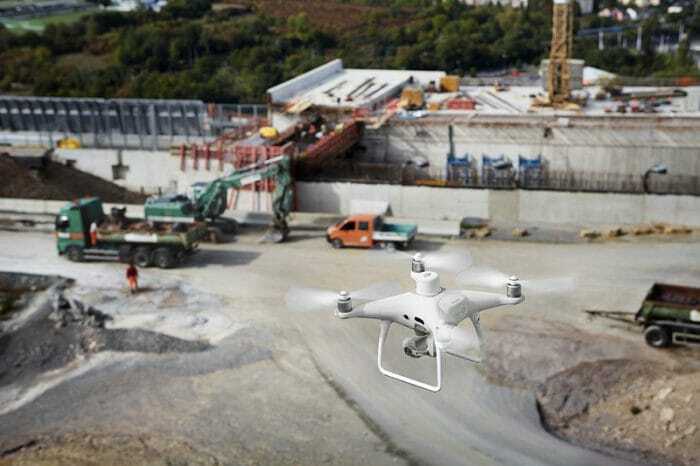 More and more people are turning to drones to help carry out everyday tasks, including mapping. And it’s easy to see why, as UAVs can cover large areas and provide highly-detailed and accurate results in a reduced amount of time. This cuts costs, boosts safety and increases output and productivity. 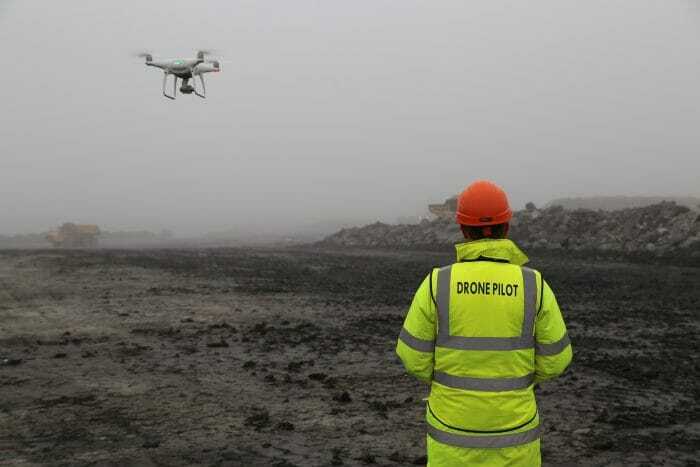 Indeed, drone mapping is being utilised across numerous industries, from mining and construction to engineering and landfill. When it comes to obtaining survey-grade accuracy from drone mapping, using GCPs has traditionally been the primary method. GCPs are marked points on the ground that have a known geographic location. In aerial surveying, a drone can be used to autonomously collect photos of the survey area. If used, GCPs must be visible in these aerial photos. The photos are then processed in the cloud using drone mapping software, creating 2D orthomosaics, 3D models, digital elevation models and 3D point clouds. For aerial survey applications, GCPs are typically required as they can enhance the positioning and accuracy of the mapping outputs. Indeed, GCPs allow the survey drone to obtain fairly accurate data. However, taking this approach does have its downsides. This method can be labourious – as it requires laying out and precisely geolocating numerous control points. Using GCPs requires a decent amount of preparation work. Depending on the terrain and/or the size of the project, the GCP method could be very impractical, difficult, labour intensive and time-consuming. In some cases, more time is spent laying GCPs than conducting the drone mapping itself. 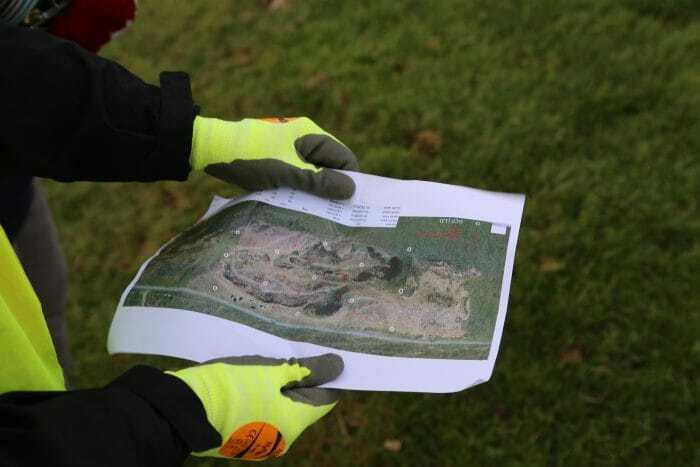 For instance, this picture below shows a map of a quarry site, covering an area of approximately 3km2. 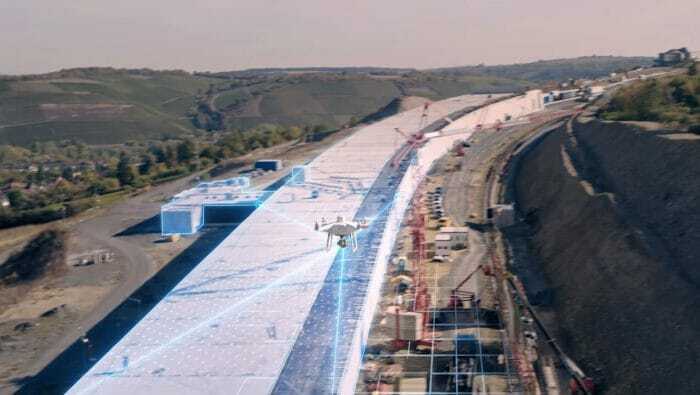 The site was mapped with a drone by Newcastle University just before Christmas. Here, a total of 35 GCPs were put out, of which around 13 were used for the model and the remainder as independent verification points. Imagine the time it took to put out all of these markers! 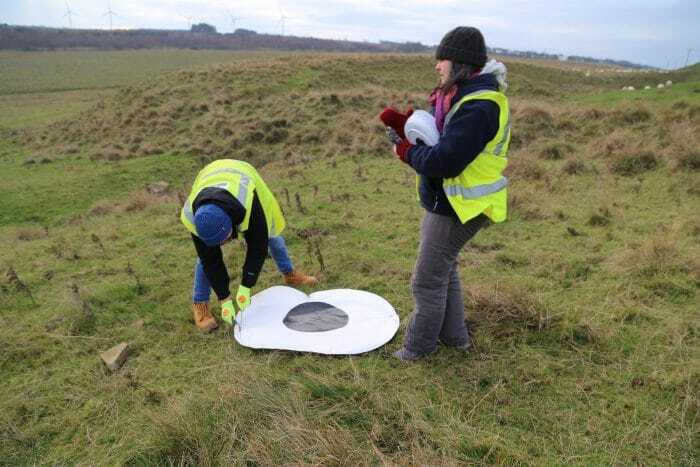 As James Goodyear, GIS and Remote Sensing Technician at Newcastle University, admits: “Installing and measuring the positions of the targets is one of the most timeconsuming aspects of an aerial survey. Admitedly this method is slightly less of a headache if GCPs are implemented on just one site, and especially if the surveying process is conducted over a large amount of time. 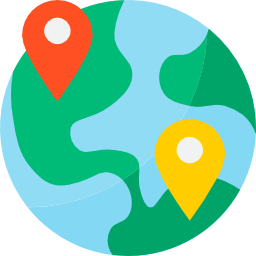 But if you’re carrying out quick-fire research, or the job is for multiple sites, then this can be a daunting task; after all, each GCP needs to be laid down and marked so that the exact geo-coordinates are known. There is a way to minimise or eliminate the need for GCPs, thereby saving time and reducing cost and also improving accuracy! This much more convenient alternative to laying GCPs is called GPS (Global Positioning System) correction technology. 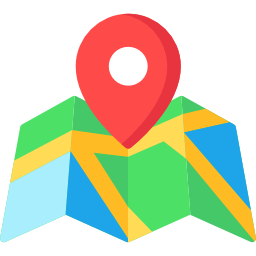 This enhances the quality of location data by using global-position system receivers to provide precise and accurate data. It’s a technology that’s been used with different tools on the ground for years. Only recently has it been offered as an add-on to a survey drone for survey-grade photogrammetry. Taking this approach can eliminate, or certainly reduce, the number of GCPs which are required. Utilising this technology can save a whopping 75 per cent of time and money spent on drone-mapping set-up, it has been estimated. 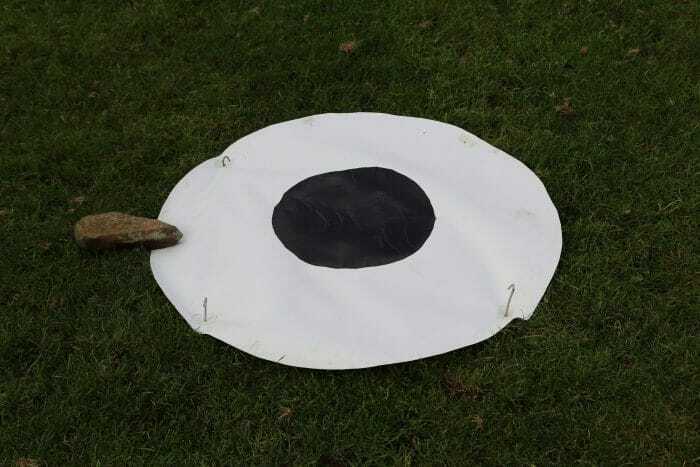 and can result in centre-metre-accurate data. There are currently two technologies driving the conversation around GPS correction technology. These are RTK and PPK. 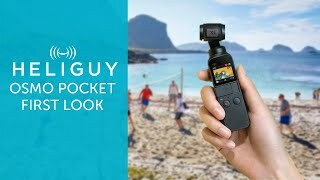 RTK is a GPS correction-technology technique that provides real-time corrections to location data when the survey drone is capturing photos of a site. Real-time correction is a major industry advantage. 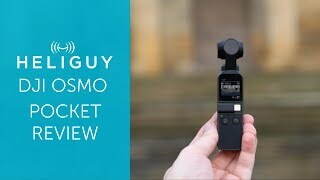 PPK is another GPS correction-technology technique that works to correct location data, except in the cloud after the drone data has been captured and uploaded. In other words, this means that in terms of positional correcting, RTK does this during the flight, while PPK makes the changes afterwards. 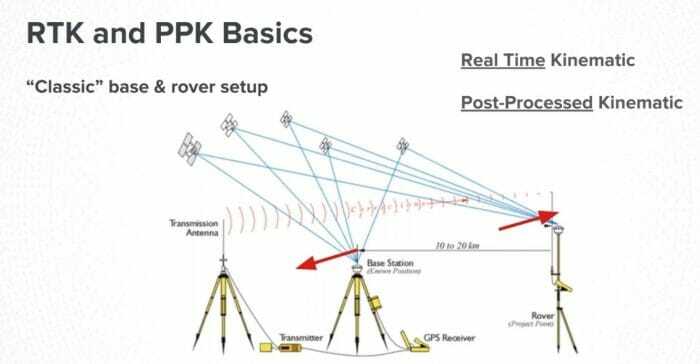 The basic idea of RTK and PPK is fairly straight forward. A GPS receiver which is sitting on the earth will pick up satellite signals that are wavering in space. Changes in the atmosphere affect radio signals from the GPS as they come down to earth, causing slight errors in the GPS position. This is why, with a single GPS, the best accuracy you can achieve is about 10 metres/30 feet. Now, it so happens that when you have two GPS’ which are in the same vicinity on earth – for example, 10 or 20 miles – these two GPS see the same error that is induced by the atmosphere. So what does this mean? Well, if you put a high-precision GPS in a known location and you tell it where it is, this is what is known as a base station. We know the position of this GPS, but at any given point in time that GPS will be measuring a position that is slightly different to where it is actually sitting. This comes from the normal errors induced by the upper atmosphere. So, instead of measuring a position where that GPS (base station) is sitting, it will be measuring a position off to the left, for example, shown by the red arrow in the image below. This means that we have a known error and we can also now resolve this error. This correctional data is then transmitted to a nearby rover station, for use in PPK or RTK. 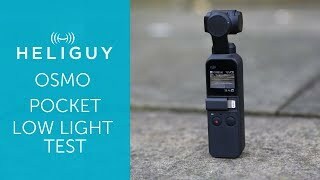 Essentially, this technique increases the accuracy of GPS signals by using a fixed base station which wirelessly sends out corrections to a receiver. This is a generalised technology and has been very common in land surveying for almost two decades. But now it is a case of bringing this to the air. 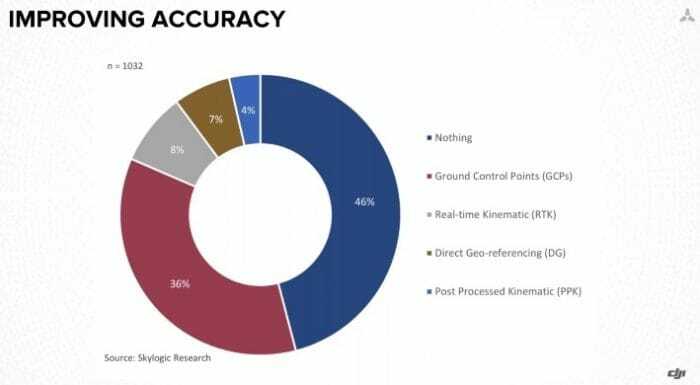 Accurately-referenced survey data created through drones relies on photogrammetry. 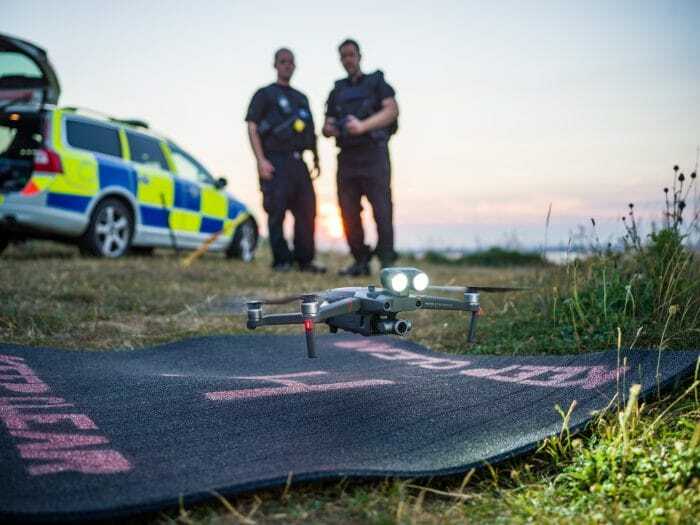 When the drone is flying, the aircraft is taking a photo on a routine interval once a second or every few seconds, resulting in a few hundred images as you fly over an area. Each of these photos overlap significantly into any adjacent photo. These adjacent images constitute a stereo pair, helping to create 3D data from 2D photos – a process known as stereo imaging. 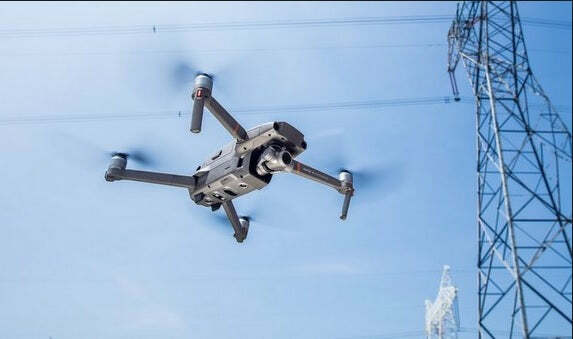 Because the position of the base station is already established, and the error is being measured, this correction can then be applied to the photo location from the drone, giving the high level of accuracy. If the photogrammetry is done correctly, then that data output will match the GPS correction accuracy of the photos themselves. RTK has many benefits, such as the pinpoint accuracy of the aircraft during flight. You and the aircraft know it’s specific location at all times resulting in exact hovering, even during high winds. Another useful feature of RTK is the accurate geotagging of the information the aircraft captures. This includes both images and video which will be tagged with the aircraft’s location for future use. 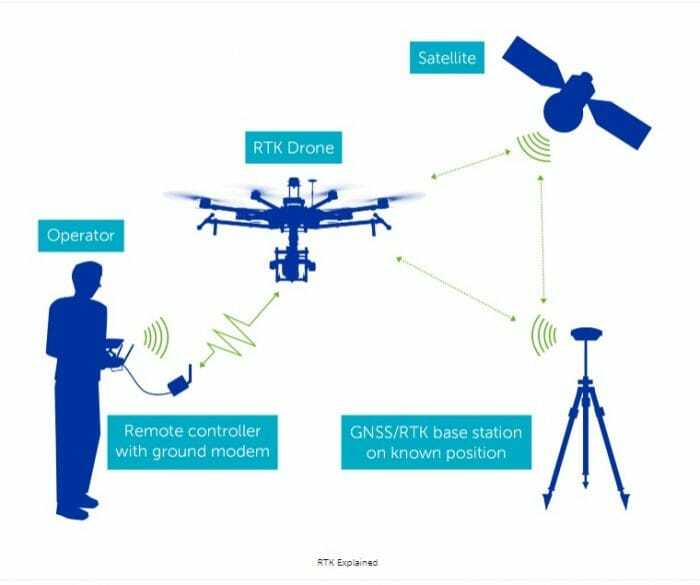 However, when it comes to aerial mapping, RTK positioning can have its downsides, with radio link outages and GNSS (Global Navigation Satellite System) signal blocks. Due to the long distances between the drone and the base station, signals can be obstructed and this results in loss of correction data and a lower percentage of accurate camera positions in the flight. PPK, on the other hand, processes the positioning information after the flight, not during. Data is logged in the aircraft and combined with data from the base station when the flight is completed. As a result, there is no risk of data or initialisation loss due to radio link outages. Th processing is similar to RTK, however PPK is a little more thorough as it traces back and forth through the data multiple times to give more comprehensive results. PPK can be used as a back-up for RTK in any surveying job. + No risk of data or initialisation loss due to radio link outages – No access to real-time data. Amazingly, a survey conducted by Skylogic Research, showed that, out of 1,000 people asked, the majority are not utilising RTK or PPK. Incredibly, 46% don’t use anything – so are relying on the GPS of the drone – while 36% use GCPs. However, William Pryor believes that this will change, saying that RTK and PPK are quickly becoming industry standards. In fact, he believes that, eventually, the GCP process will actually be eliminated and GPS correction technology will become the norm – due to it capturing more reliable data, quicker and easier. He said: “RTK technology is becoming easier to use than ever. I think we will see a leapfrog effect in drone data. 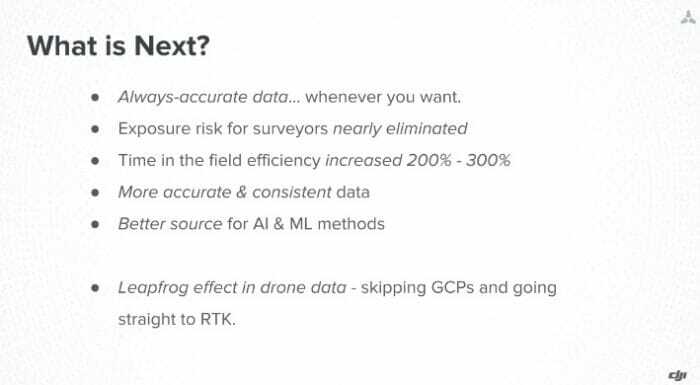 As part of the presentation, he set out the benefits of using RTK, as seen below. He added: “If people aren’t using RTK technology, then they should be, because it uncovers a tremendous amount of value in the kind of applications you can achieve. “Now, with RTK, itis just as easy to collect accurate data as it is to take a drone out of the box and make a video. RTK enables high-value workflows with significantly reduced time in the field. 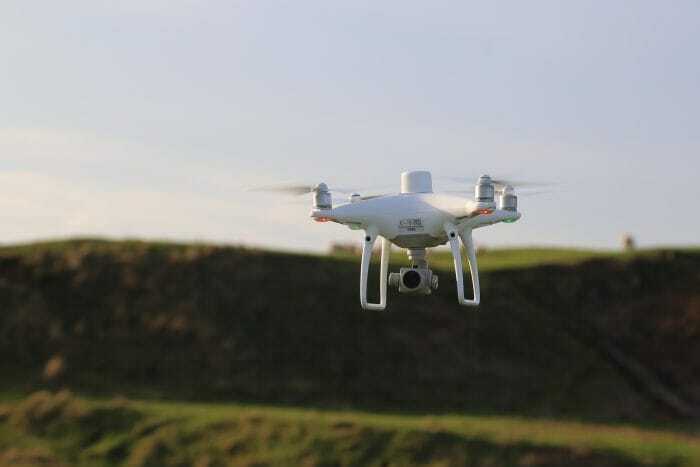 Towards the end of last year, DJI released the Phantom 4 RTK – a high-class mapping UAV, described as providing a new standard for drone accuracy while requiring fewer ground-control points. 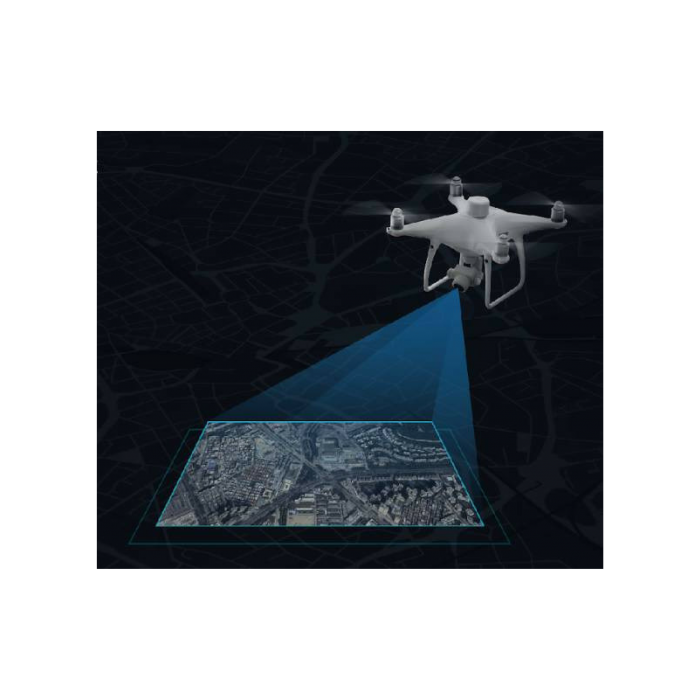 A new RTK module is integrated directly into the drone, providing real-time, centimetre-level positioning data for improved absolute accuracy on image metadata. A redundant GNSS module helps to maintain flight stability in signal-poor regions such as dense cities. 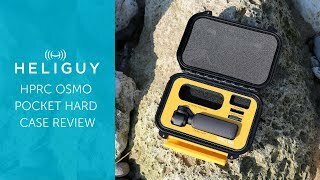 This is on par with some of the most advanced equipment available, but in a much easier to use, lower priced, compact and more reliable package. The Phantom 4 RTK has a one-inch, 20 megapixel CMOS sensor, while the mechanical shutter makes mapping missions or regular data capture seamless as the Phantom 4 RTK can move while taking pictures without the risk of rolling shutter blur. Due to the high resolution, the drone can achieve a Ground Sample Distance (GSD) of 2.74cm at 100 meters flight altitude. Enjoy stable and reliable HD image and video transmission at distances of up to 7km, great for mapping larger sites. 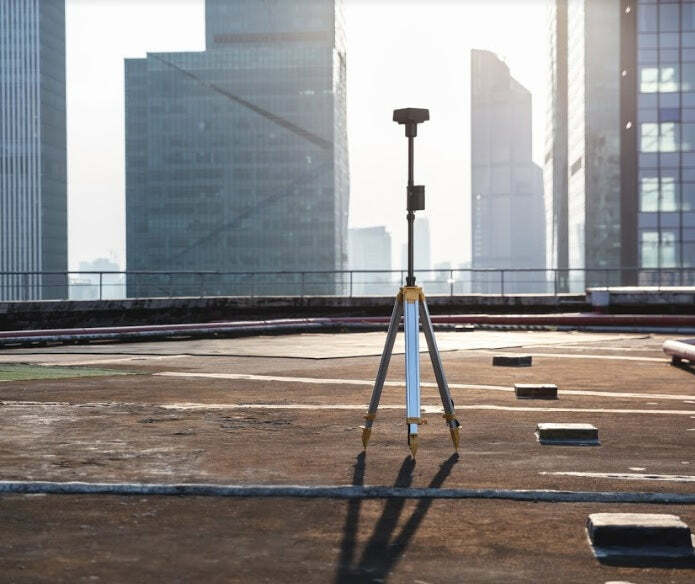 Support your missions with the D-RTK 2 Mobile Station – providing real-time differential data to the drone and forming an accurate surveying solution. The Phantom 4 RTK can also be fitted to NTRIP (Network Transport of RTCM via Internet Protocol) using a 4G dongle or WiFi hotspot, or store the satellite observation data to be used for PPK.